Siemens ST55 is not a typical product of the product range made by Siemens. In fact it is an ODM-phone elaborated by Taiwan company - Quanta (earlier it was said about Arima, but it was false information). Taking into account that another company developed this handset, many features, traditional for Siemens, are absent. 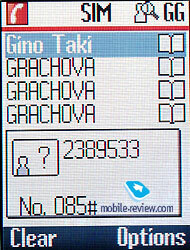 On the other hand, the phone supports 40-tones polyphony, had TFT 65K display. To some extent it is a transitional model between old models from Siemens and those, which will be launched in the beginning of the next year. We doubt that this model will have successors, it was made just to give users the most popular today functions – a camera and color. The design of the phone is typical for Asian models. 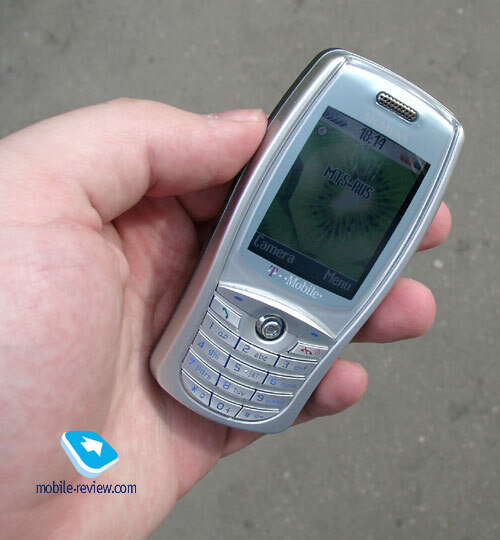 Originally the handset was produced in silver color. Probably later some other color solutions will be launched. When you look at the phone, you could notice a large screen (more than half of all the phone). It measures 28х38 mm. 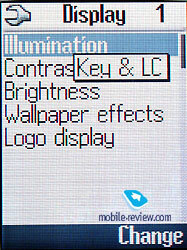 The resolution is 128х160 pixels, what allows to display up to 7 text lines, title and tips to the soft keys. 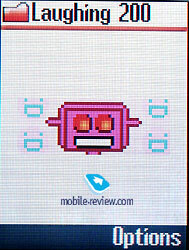 The screen has a good brightness and contrast, the picture is vivid and rich. You can change pre-installed settings but the difference won’t be very large. The picture is not so bright under the Sun, but the advantage of this phone is that it is quite visible. 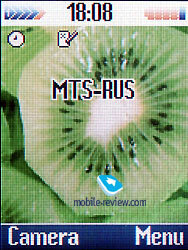 Screen saver (digital clock) or set of pictures chosen by you is displayed in the standby mode. They will change at a certain interval. Own photos taken by the integrated camera also are used as wallpapers. 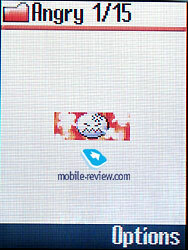 Really the screen is one of the best ones in its class. 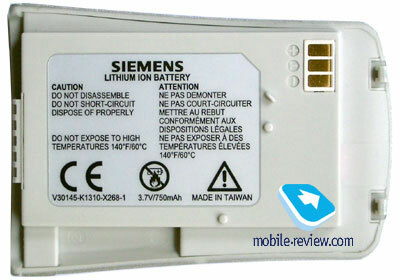 Dimensions of the phone are compatible with Siemens S55 (98.5 x 47.2 x 21.6 mm, 87 g.), but it looks a little bit thick. It’s not very handy. Although the phone has a bending shape, you always feel its edges. There are no control keys on the sides. System connector is placed on the bottom of the handset. It is not standard. It is possible to connect only handsfree or system cable (not included in the standard kit) to it. Accessories from other models are not compatible with ST55. 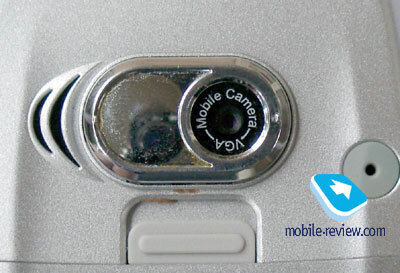 A strap hole is located on the top of the phone. Only two models from Siemens – Siemens CL50 and Siemens SL55 had it before. 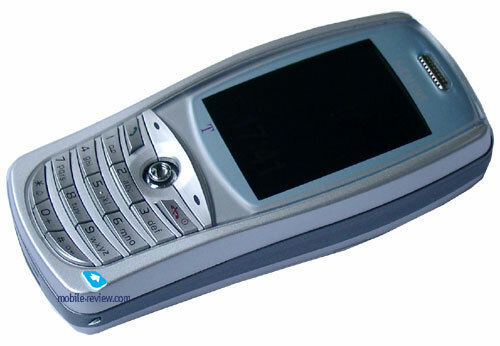 Siemens CL50 was also an ODM-phone like ST55, it was produced by another company. Siemens SL55 is aimed mainly for women and that it is why it was decided to make a strap hole their. Ladies are not a target group of ST55. We think that the main users of this model (80%) will be men at the age of 25-35 years. The second focus group will be younger users, but they will be interested in this phone only after first price reductions. 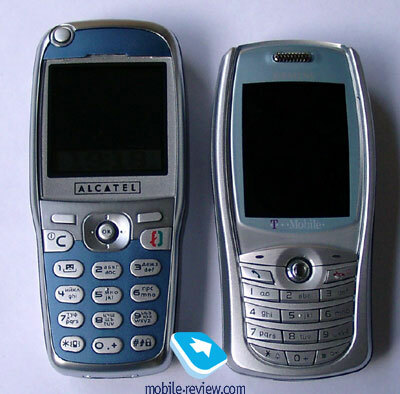 The next difference of the Asian phone is a blue color of backlighting. It is very bright and all characters are clearly seen. The keypad has a terraced spacing; all keys are small. 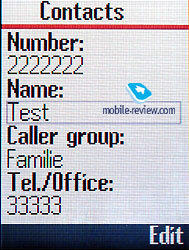 Close spacing of keys is not noticed when you dial a number, but it is not very convenient to input text messages. 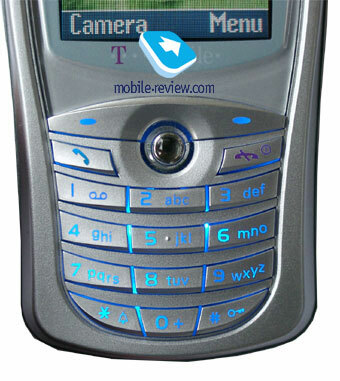 Developers decided not to increase phone’s dimensions, but reduce the size of the keypad. It was a controversial solution. Of course you’ll get used to this keypad, but it is not very comfortable. If you lay the phone on the screen, the keypad won’t touch the surface. It is a guarantee that ther will be no casual pressures. 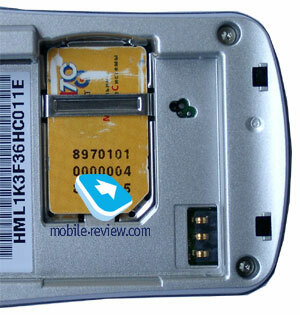 The phone supports manual and automatic keypad guard. Joystick can be used to move through the menu. It also reacts to pressures. The joystick is not large, functional and convenient. Unfortunately, the menu is not well thought out because in some menus you could move only in vertical or horizontal directions. If you confuse them, you will reach the upper level of the menu. It is just a tiny software shortcoming; may be it will be corrected later. If you lay the phone on the back side, you could see an angle between the phone and the surface. The angle is explained by the presence of camera, which is placed not deeply in the case. It doesn’t have a protected shutter. Near the camera there is a mirror to take picture of yourself. If you look from the left, you could see a loudspeaker which is used to play back melodies and speakerphone function. It is very important that the phone is raised a little above the surface, other wise the sound would be muffled, as for example, in the phones of Panasonic. 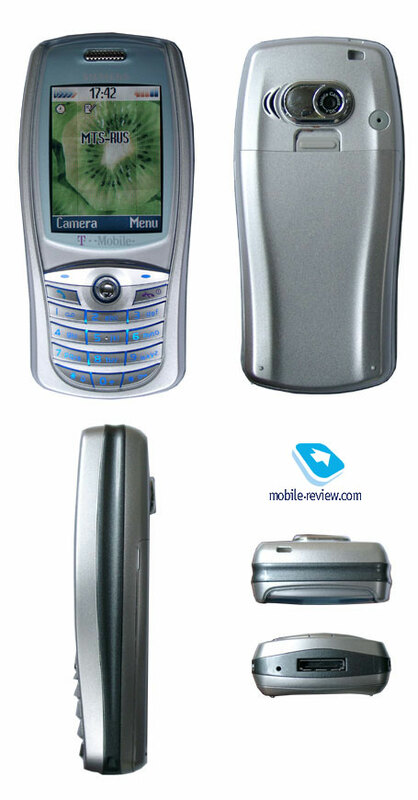 The phone is equipped with a lithium-ion battery of 750 mAh capacity. Back cover doesn’t have backlash, it is reliably fixed. According to the manufacturers, the phone could operate about 140 hours in the standby mode and up to 4.5 hours in the talking mode. 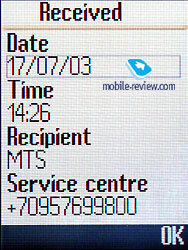 In reality (MTS network) the phone worked about 2 days in case of 20 minutes of talking and 30 minutes of using other applications. 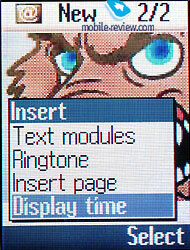 The screen used in the phone has large power consumption. If you adjust all display settings (brightness of the backlighting, contrast) to minimum you could slightly increase battery life. On the whole the phone will operate 2 days or less it you have more conversations or you use more functions. Total time of battery re-charging is about 1.5 hours. You can enter the main menu, pressing right soft-key. The main menu consists of 9 menu items, located in three rows. 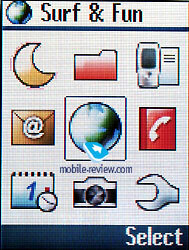 In spite of rich display capabilities, all the icons are rather simple. They look even simpler than on Siemens M55, which doesn’t support too much colors and doesn’t have high screen resolution. Shortcut number navigation is available in the menu. Voice tags can be added to selected items (list of this items is pre-default). Submenus of the main menu represent just lists of commands. A way to display information is very simple. You won’t se elaborate icons, beautiful warnings or any peculiarities. As usual you can assign switching on of digital camera to the left soft-key. The same menu will appear if you press joystick to the left. It might’ve been more interesting if Siemens assign the other function to this key. If you press joystick down in the standby mode, you’ll call a phonebook. If you press it up, you’ll get an access to voice control functions. Press the joystick to the right or just press it and you’ll reach the main menu. Let’s describe the main phone’s featuers. Phonebook. 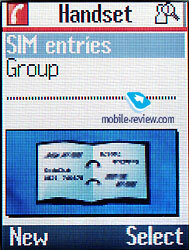 Up to 255 entries could be stored in the phone memory. Several fields are available for each entry (up to 4l phone numbers, post address, e-mail, URL, caller group). A special picture and a melody can be added to each name. Any graphic file or a photo can be used as a picture. 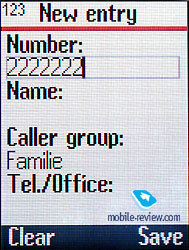 Phone number, his/her name and a photo can be displayed while incoming call. It’s interesting that they also can be displayed while outgoing call. 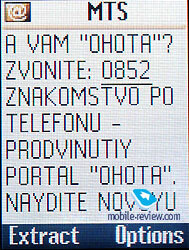 Voice tags are added to main phone numbers (default). Voice recognition is realized quite well. It operates stable, even outside. 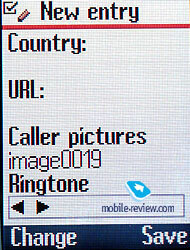 Phone numbers from the phone memory are displayed in the list of phone number. All records from SIM-card are hidden in a separate menu. There is a quick search by first letter (second, third letters) in the total list. 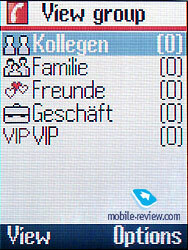 Up to 5 caller groups are available in the phone. It is possible to assign a picture or a melody to each of them. Messages. This handset supports usual SMS-messages. There are 10 templates (5 of them are editable). Predictive text input (T9) is available. 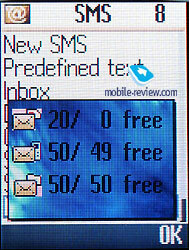 Up to 50 SMS-messages can be stored in the phone memory, the same number of messages can be kept in the archive. ST55 supports EMS. It means that it is possible to attach simple pictures and melodies to your message. The variety of pictures is not impressive. The phone has a good realization of MMS. You can create several slides, add picture, melody and text for each of them. 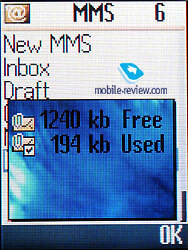 According to this menu up to 1.4 Mb of memory can be used for MMS-messages. 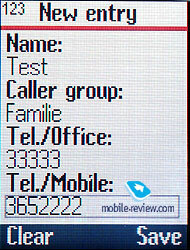 The phone supports POP3/SMTP e-mail client. It is very similar to one in other models manufactured by Siemens. We didn’t find considerable changes. 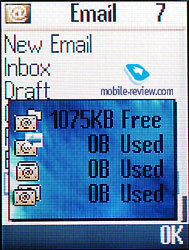 Up to 1075 Kb can be used for e-mails. The use could download either heading or the whole e-mail. He can’t download special number of Kb from the message.